I am currently working on my good friend's honeymoon. I am so happy for her allah ywafigha, and the best thing is that her sister in law is married to my cousin. He is so lucky to have her as a wife, beauty, brains, style, and the sweetest thing. Love her. So I was eccstatic when she told me she needed my help in helping plan her honeymoon. One of the countries she was going to visit was Turkey, most specifically Istanbul. I've never been there, but hopefully will when my mom wakes up inshallah. Lots of good hotels. But the one that caught my attention was a boutique hotel that have always been a favorite and the first choice for me if it was available. W hotel. W Istanbul Hotel. Very hip and trendy. I love interior design. And I know a lot who never care about the accomodation they will choose just as long as its clean. They want a place to get back to and sleep and not a place where they would indulge in its beauty. Me? If I don't like what I see, I don't stay, literally. The hotel is a big deal to me. That is why I've been the one doing the bookings for my trips with family and friends all these years. Same goes for my honeymoon. Money is no object. I love to splurge. Not over the top. I would pay above average though. And W is just perfect for me, hopefully for the lovely couple too, if they decide to go for it. Leave you with some of the pictures. Look at the Marvelous Room extra plus! Your very own private cabana! I love the idea so creative for a city hotel. Some of the standard rooms has patios with lounges and a private garden. kempinski Cirgan Palace! The best breakfast buffet in the world...ohhh next to the W hotel there is this amazing and i mean amazing jewelery boutique! 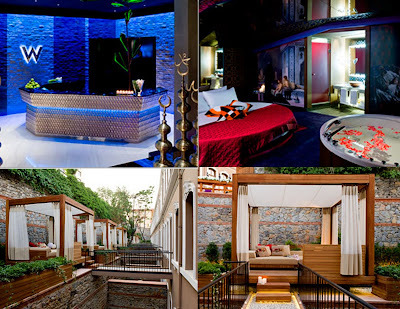 I stayed there went to Istanbul 2 months ago, its AMAZING! so u highly recommend, nothing wrong with it? Note: its my 1st post in ur blog & I have to say an outstanding blog (Y) best of wishes! Still havent been there yet but I'm dying to, I know that the location isn't bad but you have to take a taxi to go to the important shopping districts and cultural places. There's always plenty of free entertainment on hand at hostels. Next stay you should stay at Retaj Royale Istanbul Hotel, close to Airport and have free shuttle service to the city centre.